Monitor and Control the Most Important Asset You Have: Your Business! Protect your organization from costs involving: Employees, Inventory, Theft, and more. Andromeda sells, installs, services, and supports a host of recognized, top-quality access control systems in order to provide the best possible solution to your office and building security needs. 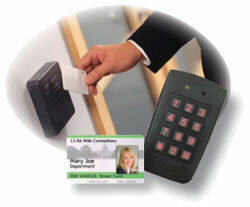 We focus on Access Control installations for businesses in the Chicagoland/Northwest Indiana areas. Know who goes where and at what time - all the time! If someone does not enter legally, the same person is unable to exit. Disable access entry at a moments notice. Link 2-way intercom & door control to your phone handsets! Andromeda Technology Solutions is a technical services provider offering 24/7 emergency response with remote access programming converging voice, data, surveillance, and access control systems. We provide Building Access Control system design, installation, help, setup, repair, and tech support throughout Chicagoland and NE Illinois. Besides the immediate Chicago metropolitan area, we are pleased to provide Access Control services to most of the surrounding suburbs. ...this is where you need to be!